Bat Star who appears in this short comedy sketch called, I'd like to buy a cape, was my first attempt at creating a Bat Storm character with GoAnimate's Lil' Peepz character creator. I actually made him around the same time as I made my Lil' Peepz, Bat Flash character (who appears in Lil' Bat Flash, End of the Road), but didn't really have a project to use him in. Since then GoAnimate has added a whole bunch of Superhero costumes and I've made a better Lil' Peepz Bat Storm (pictured left). Which is why Bat Storm, Mark 1, is now called Bat Star. 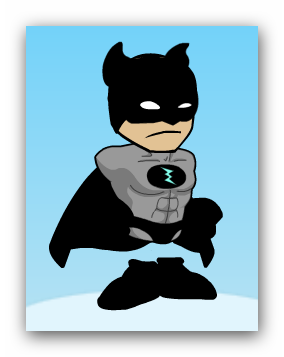 Up until very recently you couldn't add a cape to any GoAnimate Lil' Peepz or Comedy World character - This is why my Comedy world Bat Storm character does not have a cape. In one of my unreleased early previews for Bat Storm I had him in a clothes store very similar to this video (but using a Comedy World background) asking about buying a cape. However that's as far as I got and never expanded on the idea. After creating a lot of adult language (read lots of cursing and adult themes) animations for the Youtube Channel Direturtle (you can see a playlist of the videos I created on my tetanimations channel) using other peoples scripts I felt like creating something similar but with my own script. Superheroes don't usually curse this much so it's kind of both funny and confronting at the same time. If you're not into cursing then don't watch. Note that the Text to Speech voices would not pronounce the word 'cape' correctly no matter what I tried so 'gape' is what you hear. This joke kind of evolved over the course of making the video. I just started with the idea of Bat Star wanting to buy a cape and then set about seeing where it went and how I could make it funny. My Lil' Peepz Ironman (referred to here as 'Ironcan') wasn't made specifically for this video. I just made him to see if it was possible to make a good Ironman Lil' Peepz character. When I realised he fit right in with opposing Bat Star's premise that all real superheroes wear capes I just had to include him. If the text to speech voices could say 'cape' correctly this would be what I consider the perfect GoAnimate short. It's a bit edgy and it tells an original, short but funny story (rather than just animating a familiar joke). I particularly like the soaking they all get at the end. Even buildings have no respect for superheroes these days!